This is a recipe-repost. My original picture did not do these justice, so I thought I would update the post with a new and improved picture. I know it still is not the greatest photo, but it is a lot better than the original. This recipe is so amazing that it deserves a repost and incase any of you missed this recipe the first time around, do not pass it up this time. These Carnitas make an appearance at my Dinner Table at least once a month. I have made them countless times since I first tried them last September and they come out perfect every time. 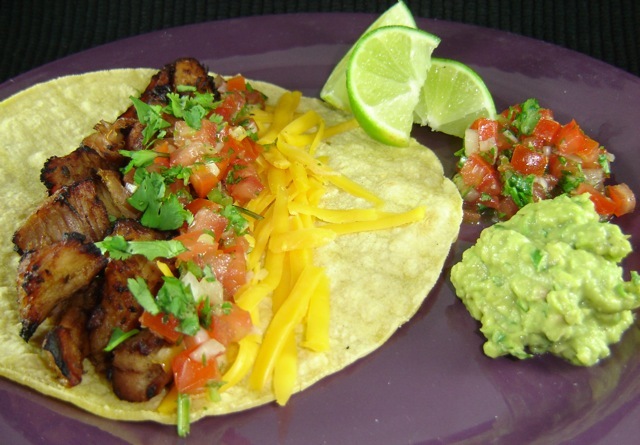 These are Jake's FAVORITE Mexican dish that I make and he requests them all the time. They are so easy and the end result is nothing short of INCREDIBLE. They taste like "street tacos." 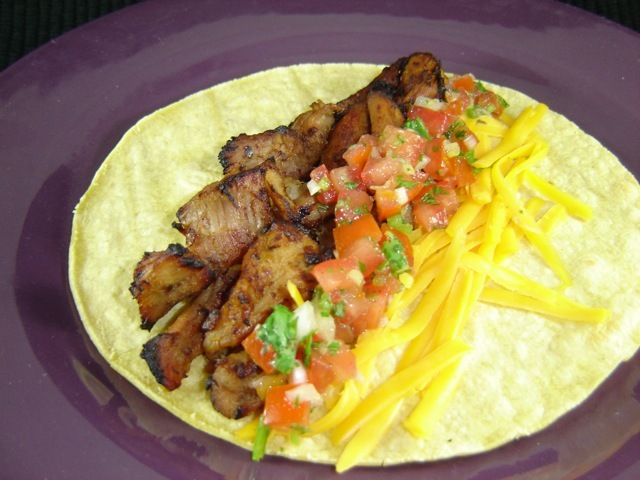 Carnitas are usually deep fried, but America's Test Kitchen broils the meat at the end to mimic the same crispiness that deep-frying would give the meat. If you haven't already got the hint - you have got to give these a try. Cut pork into 2-inch cubes. Cut out any large pockets of fat, but leave some fat, because it adds valuable flavor. Place pork cubes in a large, oven-safe pot. Sprinkle with oregano, cumin, salt and pepper. Add bay leaves, lime juice, onion chunks and water. Juice an orange and add the juice and the orange halves to the pot. Stir together and bring to a simmer. Cover with lid and put in a 300 degree oven. Cook about two hours, flip meat over halfway through. When done, it should be fork tender. Remove from oven and take out all the solids. Put the meat in a bowl and discard the onion, orange halves and the bay leaves. Cut some of the meat into smaller pieces. Boil the remaining liquid to form a glaze, about 10-15 minutes. Pour the glaze over the meat and toss to coat. Spread out evenly onto a rack placed over a cookie sheet. Place back in the oven on the middle rack and broil 5-8 minutes, flip over and broil 5-8 minutes more to get nice and crispy. Serve on toasted tortilla shells with shredded cheese, fresh salsa, lime juice, chopped cilantro and any other desired toppings. I absolutely LOVE your blog. I've recently become a newlywed(yay!) and I'm from the Mississippi while my husband is from Vegas. He does not like southern cooking at all so I've been trying alot of new recipes on Pinterest. Alot of the recipes do not turn out well. Kinda flavorless, so I'm so excited to see your blog where you've actually tried and made NOTES on what you've made. THANK YOU! These sound incredable. I have pinned them for when the weather cools a bit. I love carnitas and I cant wait to try them. I made this a while back and everyone in my family loved it -- so much so that my husband requested them for his birthday dinner. Delish again! Thanks so much for posting this. P.S.--I cooked the pork for about four hours and it came out perfect.